Every once in a while, a home captures your attention and makes you want to learn more. 7 Winter Street in Watertown is such a home. When we first visited the home, we were struck by not only the location, but also by the architecture. Growing up in New England and being in Real Estate for many years, we were used to traditional Colonial homes, Splits, Ranches, Capes Gambrels, Greek Revival and Mid-Century Modern homes, but this home was different, it was elegant and sturdy. It asked to be noticed, and notice we did. It stood up on the lot with a stately granite stairway, a smallish center entrance, quoins on all four ends and a slated roof. Oh, that roof, that magnificent roof; a four-sided gambrel hip roof with dormers, much like a wedding cake. The architecture looked familiar, we just couldn’t pin down where we had seen this style, but we knew we needed to find out more. We began our research with the current owners who told us it used to be known as the abandoned or haunted house. They assured us that they never saw any evidence of any paranormal behavior and it was called that because of its appearance. They went on to tell us that the home at been in disrepair for some years before being purchased in 2008, razed and rebuilt in a similar style using many of the same architectural elements as the original home. That was a good start, but we need to learn more. And our research didn’t disappoint, let’s just say if walls could talk this home would have some pretty interesting stories to tell. Built in 1874, in the popular French Second Empire style, it was one of the grandest homes in Watertown and was registered in the national register of historic places. The once stately home became embroiled in a bitter family dispute, that resulted in the divorce of the patriarchs and the house being passed on to the son, Roberto. It is unclear to us if Roberto ever lived in the home, but what we do know is that he had no interest in maintaining it. The home quickly fell into disrepair, became a boarding home in the 1980s, then was left vacant only to be occupied by squatters and ultimately condemned in 2002. So how did such a sordid past lead to this elegant building that is now home to three beautiful condos? In 2008, acclaimed builders, Nicholas and Peter Davos signed a purchase and sale and set out with plans to restore it to its original glory. Eight months after signing the agreement, Roberto tried to quietly sell it for a $1 to Michael Cresta. The Davos brothers fought and won a legal battle and ultimately bought the building in 2009 with a vision to use as many of its original features as possible. They hired the Somerville-based architectural firm, Khalsa Design and construction began on what had once been an eyesore in the Watertown Square neighborhood. While its sordid history was fascinating, we still needed to find out more about this architectural style and our search went from old newspaper articles and calls to the Watertown historical society to architectural journals. We discovered that the architecture is known as French Second Empire style and can be traced to France, specifically to the reign of Napoleon III. 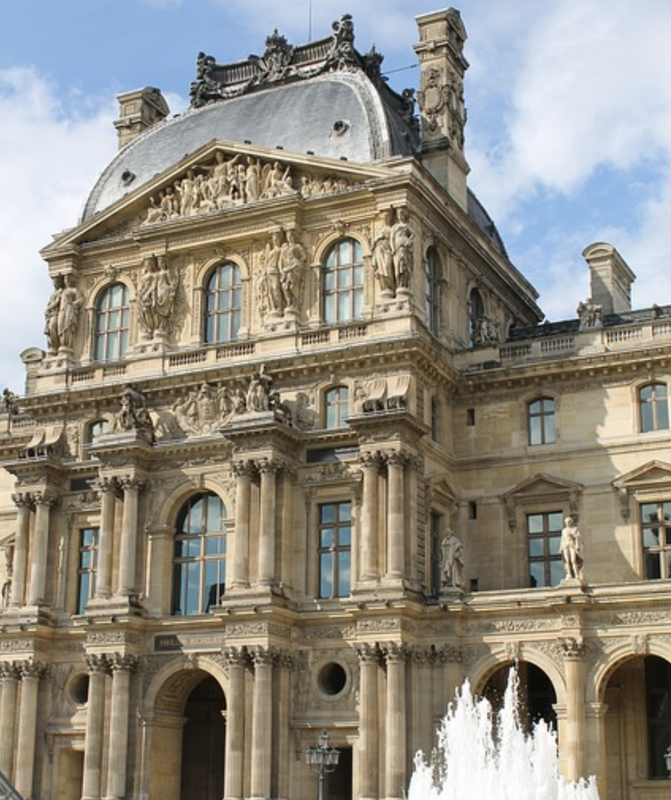 Part of the roof of the Louvre was built in this Mansard style. So, this sturdy home in Watertown that caught our attention shared its architecture style with the likes of the Louvre! Impressive! In the height of its popularity (1855 to 1885), the French Second Empire style which exudes a sense of permanence and character, was considered both fashionable and modern. Many architects feel that it is one of the most striking American house styles, and its presence in America, is a beloved and enduring gift from our French friends—almost as precious as the Statue of Liberty. The roof that first caught our attention is known as a Mansard style roof, with its sloping gables and dormered windows that project like eyebrows, beautiful railings and corniced corners. Half roof, half extra story. The point of the Mansard’s dual-pitched roof is to add a full floor of living space without increasing the number of stories. And thus, avoiding the need to pay taxes on the additional floor. The top of a mansard roof is typically broad and flattish (although examples of barn like tops can be found) to maximize the space below it and in the case of 7 Winter Street even provide for roof top entertaining. With a greater understanding of the architectural style, we see it is not so uncommon. The White House has a Mansard style roof, as well as the Library of Congress, the Eisenhower Executive Office Building and so many more. Boston’s Beacon Hill and Commonwealth Avenue have notable examples of this architecture and in almost every suburb in the Greater Boston area you can find these stately homes with that wonderful flat roof. Is Real Estate Video the Future of Home Sales?